In the core body of Japanese mythology, lies a number of myths and legends that are similar to Indo-European mythologies. Myths and oral traditions about a Primordial pair (and the churning of the ocean of milk), a storm god Susanoo as well as Raijin, rival brothers, oni demons like the Uighur/Ogur ones, Yama deity, subterranean Land of Yomi for example, the Sun Goddess Amaterasu, Xi wang Mu, earth, grain and hearth goddeses, Ryujin the Sea-King, and there are many more… It is a most tantalizing task to speculate on the route by which these “foreign” deities and mythical motifs arrived in Japan. “An exhaustive analysis shows for the first time that the principal gods, goddesses, heroes and demons belong to just six generations of one family. Examples of names and themes found in both Indian and the other mythologies are given. The sources of Irish mythology are summarized… Genealogical listings are confused and of little value but links with other Indo European mythologies, including Persian and Indian, are clear. Germanic mythology is primarily Norse and the best known sources are the Poetic and Prose Edda which originated in Iceland. But major source of similar age which is apparently little recognised is the “History of Denmark” of Saxo Grammaticus. These and other sources are summarized and analyzed. Numerous links with other Indo European mythologies are identified. [myth more from linked Germanic/Norse page: “… both individual names and family relationships are important in understanding Indo European mythologies and Norse mythology makes significant contributions in this area. In particular, as we have noted elsewhere, the oldest name of the Norse King of the Gods, Gwoden, is identical in form to one of those of the Indian King of the gods, Gadhin (though usuallly called Indra), and to that of the Welsh wizard, Gwydion…. The Name of the King of the Gods: As we have noted several times, the oldest form of the name of the Norse King of the gods is Gwoden, and this is essentially identical with Gadhin, one of the names of the Indian King of the gods, Indra. It is also the same as that of the Welsh wizard, Gwydion. Goats For Horses: Thor, as is well-known, has a chariot drawn by two goats; this is not discussed or explained. The Indian Pushan also has a cart drawn by two goats, a fact which is also not explained. We do not identify Pushan with Thor, but this is so distinctive that it is a probable element of an original Indo European myth. Creation of the World: There is a remarkable similarity between the Norse sacrifice of the giant Ymir and of the Indian Brahma to create the world. The Two Races: The conflict of two separate peoples who finally join in marriages is found in several mythologies. In Norse are the Aesir and the Vanir. In Indian we have the Asuras and the Devas. Note here that the Asura are the demons so that there is some role reversal, but this is similar to Persian where the Ahuras are the gods and the Daevas (including Indra) are demons. And in Irish we have the Tuatha de Danann and the Sons of Mil. The names do not match exactly though we believe that it is likely that the Norse “Vanir” derived from a corruption of some from like “Danavanir”. The Rival Brothers: Several Indo European mythologies have accounts of one of the most prominent legends, that of the rival brothers who both support and fight with each other. However, Norse legend is of particular interest because it preserves names that are generally not found elsewhere and describes a distinctive example of the conflict. …the beautiful second wife of Brahma was called Gayatri; and we believe that one of then other names of Brahma was “Varuna”. The similarity between Varuna and the Greek name of Uranus has been noted for a long time, and the name of his wife is “Gaia”. The above article also examines the links “between ancient Akkadian and modern Hebrew and Arab languages” and “the links for ancient, hieroglyphic Egyptian and the related modern Coptic … The age of Akkadian is fairly well identified as about 2300 BC or 4300 BP (before the present)” which is deemed to be “different from the value of 2240± 140 years derived from our detailed analysis of the well-established Indo-European languages”. A new study asserts that “Indo-European languages originated between 8,000 and 9,500 years ago in Anatolia”, see the Washington Post article below. With the end of the Hittite empire, Anatolia and the whole of the ancient Middle East were severely shaken. Migratory groups of the Sea Peoples moving along the south coast of Anatolia and the seashore of Syria and Palestine caused great havoc and upheaval. The Sea Peoples followed the ancient trade route between the Greek Mycenaean world and the coastal cities of Syria, the commercial centers of the Middle East. The geographic characteristics of Anatolia facilitated the west-east connection, while the mountain ranges along the northern Black Sea coast and the southern Mediterranean hampered the traffic between north and south. “Heth was the progenitor of the Hittite nation, whose name was known to the Assyrians as the Khatti. The Amarna tablets contain letters that were sent from the Hittite emperor Suppiluliuma to the pharoah Amenhotep IV. Ramesses II also tells ush ow he engaged the Hittite in what was the earliest recorded battle involving massed chariots. Representations show them to have possessed high cheekbones, and cranialogists have observed that they had a few characteristics of Mongoloids. More recently, another possible corroborating link appears in the discovery that the Hitties mastered the art of casting iron and the taming of horses. In some Egyptian paintings, they are portrayed with two distinct facial features. The typical one has a high cheekbone, oblique eyes, and wears the hair in a pigtail style, and the other has a clean-cut head and nose. Apparently, Heth produced two distinct tribes. which according to scholars, was a n Indo-European language. This language used cuneiform script and is called cuneiform Hittite. Later, a yet-different I-E language using hieroglyphic script superseded the cuneiform script, and this language is referred to as hieroglyphic Hittite. A people descended from Canaan the son of Ham, they inhabited the city of Shechem. A t Genesis 36:2, Zibeon, the grandfather of one of Esau’s wives, is called a Hivite. But verses 20 and 24 list him as a descendent of Seir the Horite. The word Horite may be derived from the Hebrew word chor (“hole”) and may mean merely “cave dweller”. This would eliminate any seeming discrepancy between the texts at Genesis 36:2 and veses 20, 24. Archeaeologists have unearthed ancient writings that scholars have interpreted as proof that a nation called Hurrians inhabited the regions of Armenia, Anatolia, Syria, and parts of Palestine from patriarchal times and believe that this people included the Hivites, Horites and Jebusites. They equate Horite with Hivite and believe that some Hurrians came to be called Hivites. Their theory is based to a great extent on linguistic similarities, particularly in proper names. The name Horite is, therefore, generally thought by them to be related to Hurrian rather than to mean “cave dweller”. His descendants are known as the Sinites; the Sidonian called them Usnu, and some some refer to them as Usana and Siannu. Gessenius identifes Sinim with China. Others also identify it with Sinae China. Further the Greeks and Arabs at one time referred to China as Sin. At one stage, southern China was actually known as Sinai according one ancient India as described by Ptolemy, which had some tribes of Ikhthyophagi Aithiopes–that is , the dark-skinned fish eaters. Many of the early traders with the Scythians were known as the Sinae with a capital at Thinae, modern Thsin in Shensi Province. From here, we get the dynasty of Tsin, called by the Malays Tchina, and so it remains today: China. Of further interest is that the Chinese regard Siang-Fu (father Sin), capital of Shensi province, as the origin of their civilization. It is evident that the Sinites spent some time in China anciently and gave their name to China. In Egyptian monuments, the Hittite peoples were depicted with prominent noses, full lips, high cheekbones, hairless faces, straight hair, sometimes wearing their hair in a pigtail, and dark brown eyes. The term Hittite in cuneiform appears as Khittae, representing a once powerful nation from the Far East known as the Khitai, and has beenpreserved through the centureis in the more familiar term Cathay. The Cathay were Mongoloids, considered a part of the early Chinese stock. There are links between the known Hittites and Cathay–for example, their modes of dress, their shoes with turned up toes, their manner of doing hair in a pigtail, and so forth. Representations show them ot have possessed high cheekbones, and craniologists have observed that they had common characteristics of Mongoloids. It may also be possible that the descendants of these two brothers intermarried and formed a new tribe of people. “The Indo-European myth of creation or Primal Cow Creation Myth was borrowed into some of the Western Semitic Languages at a very early time. The similarity has been noticed before by a number of authors, but the connection to the Primal Cow Creation Myth was perhaps overlooked. This article shows that this Proto-Indo-European Myth has been borrowed into the Semitic languages, and appears in the Bible, and may possibly be the source of the creation myth in Genesis. There are three main sources of information about the west Semitic creation myth in which a being called Yam (or Yama or Ymn in some dialects) is dismembered and the world is created from his body. From the Ras Shamra tablets, written in the Ugaritic language (an early form of Phoenician), comes the story of the conflict between Baal and Yam. From late classical Greek sources comes a series of creation stories, actually genealogies of the Gods, as they are attributed to the Phoenicians. However these stories are told in Greek and most of the actual Phoenician forms of the names of the Gods are not given. And finally, in the Hebrew of the Old Testament of the Bible, the speaker of Psalm 74 praises a god (“Elohim” in this case) by describing how he overcame Yam and perhaps some other beings and fed them either “to the sharks” or “to the people in the wilderness” depending on the translation (which varies widely). The Psalm then goes on to describe the creation of the world. A more detailed discussion follows here. “*Aeusos with a reconstructed form *Haéusōs is a Goddess of the Sun and Hearth Fire. More broadly, the name is applied to certain specific Goddesses, usually the Sun, the stars (especially the planet Venus). The same word is also used for a class of gods (‘those that shine with a golden light’); and a general word for ‘a god, any god or goddess.’ These words are also used as an honorific for human beings of high rank, e.g ‘lady, lord.’ These Gods are general to the Indo-Europeans, but they are strongly affected by the Pandemonium. There are two main reconstructions. One is associated with heavenly bodies and means ‘Sun, Stars and Dawn’ (‘that which glows, shines with a golden light’) and the other with ‘Fire, Season of Warmth’ (‘that which burns’, with a transitive verb ending, -ta), however both forms can appear as either a Sun Goddess or a Hearth Fire Goddess. The deities are listed here but described more fully in the article *Aeusos. *Haéus(ōs), is usually a Sun Goddess (p. 409, 410, 432, Oxford Introduction) with forms in Hittite, aššu ‘lord, God’; Sanskrit, Ushās, Goddess of Dawn, but later the Ashuras are demonized; Avestan, Ahura Mazda, the good god of the Zoroastrians, and ahura, a good spirit; Greek, Éōs, a Dawn Goddess; and Latin, Aurōra, a Dawn Goddess. Gallic Esus is a God of Hearths; and Old Norse, Aesir (pl. ), and Old English Ôs (m.sg.) and Ose (f.sg. ), are general words for ‘a god, any god or goddess.’ Slavic, Jarilo or Iaro, is a God of Summer; and Lithuanian Aušra is ‘dawn’; while both Latvian Auseklis, and Lithuanian Aušrinė are Goddesses of the Morning Star, i.e. the planet Venus. The form Arap Ushas appears in Albanian folklore, but there it is a name of the Moon. *Haeust(e)ro (p. 294, 301, Oxford Introduction, but see the form “*as-t-r, with intrusive -t- [between s and r] in northern dialects” given on p. 702 and 780, in Indo-European and the Indo-Europeans by Gamkrelidze and Ivanov, hereafter abbreviated G&I). She is seen in the Anatolian dialects as Estan, Istanus, Istara; in Sanskrit, Atri, fire but demonized and replaced with Agni; Avestan Atar, sacred fire of the Zoroastrians; Greek Hestia, Goddess of the Hearth; Latin Vesta, Goddess of the Hearth; and in Old English Eostre, modern English Easter, Goddess of Spring. Armenian Astghik is a Star Goddess; and the Tibetan Buddhist Goddesses like Green Tara are protective deities connected to stars or the planet Venus. *Arta is one of the most important of the Proto-Indo-European Goddesses and very easily reconstructed on both linguistic and comparative religion grounds. There is a very brief mention of some of the forms of her name in the article on Proto-Indo-European Ritual. The Sun and Moon are her children, for example in Welsh myth they are the children of Arianrhod, see How Lleu Llaw Gyffes Got His Name for a retelling in English of this myth. Devis and Devas are found among all the Indo-Europeans, and the word is often used as a general word for ‘a god, any god or goddess’ and sometimes for a specific Goddess or God. These words are also used as an honorific for human beings of high rank, e.g ‘lady, lord.’ Here again, the use of this word as a general word for any deity is affected by the Pandemonium. The forms of her in each Indo-European language are discussed more fully in the article *Devi. Note also that in Sanskrit, Avestan and Hindi, words that end in -a are masculine and -i is feminine. In the western languages the situation is reversed, so that words that end in -a are usually feminine and words that end in -i, or more often -us, and -os are usually masculine. Here the forms are divided into masculine and feminine forms for convenience. “Anthropologists list Ancestral Spirits as one of the types of supernatural beings and they are “seen as retaining an active interest in human society” p. 348-350, Haviland. Called *patri- > Patris or Patrikas (e.g. ‘fathers, little fathers’, p. 194-5, EIEC) and *mater > Matris or Matrikas (e.g. ‘mothers, little mothers’, p. 385-6, EIEC) both with diminutive endings in various cognate forms, they were worshiped among all the Indo-Europeans. Generally, people do this by going to grave sites and offering food, flowers and lighted lamps or candles. The Indo-Europeans worshiped their own parents as a community at regular times of the year, especially in May and November. As Scythians, probably, had no writing, we are compelled to address to antique sources, most important of which is 4 book of Herodot’s “History” where seven deities of a Scythian pantheon are listed and two versions of a legend about an origin of Scythians – the unique Scythian myth kept entirely are stated. The variant of the same myth is given also Diodor Sicilian. “According to Herodot into structure of a pantheon entered seven deities that reflects ancient Indo-Iranian tradition. At the supreme place of hierarchy is Tabiti, on average – Papay and Api, on the lowest -Hoytosir, Argimpasa and two deities, which Scythian names are not named by Herodot. All these gods are identified by Herodot as: Hesta, Zeus and Gaia, Apollo, Aphrodite, Heracles, and Ares. As Herodot wrote the most powerful, and numerous of Scythian tribes – Imperial Scythians – worshipped to Poseidon which at them was called Tagisamad. <…> Deities of average and partly the lowest level appear and in ‘Legend about an origin of Scythians’. Most full this myth is stated Herodot in the first version. In the uninhabited territory, after received name Scythia, from marriage Zeus and daughter of Borisphen (Dnepr) the first person – Targitay is born. Three his sons become ancestors of various parts of Scythian people <…>. The sky gold subjects – a plough, a poleaxe and a bowl fell. At attempt of two senior brothers to come nearer to them gold is ignited, but with approach younger one fire dies away and Kolaksay seizes sacred attributes. “…a fiery horse, a hut standing on four chicken legs (as in Russian fairy tales!) and a woman (goddess) with the fiery hair. A child is seen in this fairytale hut. These data correspond to the Russian fairy-tales about Baba-Yaga (the old woman Yaga). I think that the personage Baba-Yaga corresponds to the Scythian goddess Tabiti. I have counted ten rays at her head in this figure. The face of a goddess is represented on a Scythian brooch discovered in the Belyaus burial ground, the Crimea, Ukraine (Dashevskaya 1991: 121, table 65, figure 10). It is a designation of Tabiti whose head is decorated with nine or ten rays. As has been shown earlier (Rjabchikov 2001a), Baba-Yaga (cf. Old Indian yaga ‘sacrifice’) is closely related to the fire god Agni. Actually, this god plays the main role in sacrifices according to the Indo-Arian mythology (Neveleva 1975: 85). Let us examine some features of Baba-Yaga. V.Y. Propp (1998: 147) stresses her roles of a donor, an abductor, a female warrior. The last function is in my opinion a hint at the Amazons, otherwise the Sarmatian women. In Baba-Yaga’s hut the initiations are performed (Propp 1998: 157). She denotes the fertility without the participation of men (Propp 1998: 168); she directs winds; she keeps keys from the sun (Propp 1998: 169). As an ancestress she is connected with the hearth (Propp 1998: 171). She gives her horse (Kobylitsa-Zolotitsa ‘The Golden Mare’) to a hero (Propp 1998: 172). Some epithets of the horse which is equal to the god Agni are “with a golden mane”, “having a light-coloured back”, “with a fiery head” in the Indo-Arian beliefs (Propp 1998: 264). The main attributes of Baba-Yaga are the fire and the horse (Propp 1998: 190, 197). Besides, she is preparing a youth for a marriage; she is burning or boiling children (Propp 1998: 198, 200). Baba-Yaga knows the future and betokens (Afanasiev 1996: 57). And now one can examine an information about the Scythian goddess Tabiti mentioned in the History of Herodotus (Book IV): she compares with Hestia, the Greek goddess of hearth and home who is a virgin and the eldest sister of the god Zeus (1). All these features fit the features of Baba-Yaga (hearth; initiations; without a husband; connected with winds). The edges of roofs in the ancient town Panticapeum, the capital of the Bosporan kingdom (modern Kerch, the Crimea, Ukraine), were decorated with masks of a goddess (Blavatsky 1953: 173, figure 7). Since her hair is shaped like tongues of flame or rays of the sun, this is Tabiti, the goddess of hearth and home. It is well to bear in mind that D.S. Raevsky (1994: 204-5) points to the similarity of Tabiti (Tapayati ‘Heating; Flaming’) to Agni. In a Scythian inscription I read the words Tabera vese ‘Knowing Tabiti’ (Rjabchikov 2001a). The names Tab-iti and Tab-era (cf. the Russian suffix ar) ‘Heating; Flaming’ are the variants. One can suppose that the Scythians translated the name Tabiti as Ta biti ‘Beating’ (Trubachev 1981: 23), too. The beating Baba-Yaga is also known (Propp 1998: 180-1). [Ed note: One wonders if Baba-Yaga has a connection with the Japanese myth and folktale of the Sanzu no Baba 三途の婆= Shōzuka no Baba=Jigoku no Baba 地獄の婆=Datsueba who are varying folk versions of a hideous creature or hellish hag by the name of Shozuka-no-Baba etc. who strips children crossing the Japanese River Styx – Sainokawara, of their clothing, then encourages them to make piles of stones to build a stairway to paradise. (The afflicted children are then consoled and saved by Jizo/Ksitigarbha who hides them in the wide sleeves of his robe. In the Japanese context, the Jikoku no Baba lit. “Hell’s Hag” is obviously related to death or funerary customary practices because it occurs in the context of Sainokawara and Jizo guiding dead souls. Baba-yaga is a hag, crone or witchlike person or seer/fortune-teller (Romani gypsies) In Tibet, the Yagas are thought to either Bon Po demon-and-fire-worshippers or the fierce demons themselves: Grandmother Demon, Grandmother Dragon, the fearsome, the fierce The Hungarian bábák meant “old woman”, originally a good fairy with magical abilities who in later eras was regarded as having become degraded and became evil. She was thought to live in fountains, and if young children went too close to her lair, she lured them in. She was also thought in mythology to have possessed a táltos shamanic function and able to fly between the Upper/Middle/Underworlds on the back of a horse, so one of the theories about the ancient Hungarian religion is that it was a form of Tengriism, a shamanistic religion common among the early Turkic, Uralic and Mongol people, that was influenced by Zoroastrianism when the Magyars (perhaps the Arpad-Attila the Hun lineage) encountered the Persians during their westward migration. Japanese Demon Lore suggests that the Jigoku no baba / datsueba and yamaumba (Mountain Hag) reveal the dichotomons nature of the goddess of birth and death. She tortures or kidnaps small children or alternatively she is the force behind urging children to behave …as well as delivering what goes around comes around to unsavory stepmothers. 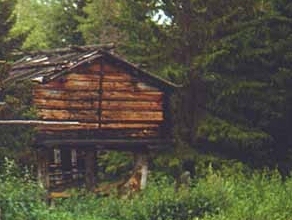 The hut is surrounded by a palisade with a skull on each pole, or both. The fence with a skull on pole (overtly mortuary or ritual function) or the fence outside is made with human bones with skulls on top, often with one pole lacking its skull, leaving space for the hero or heroes. 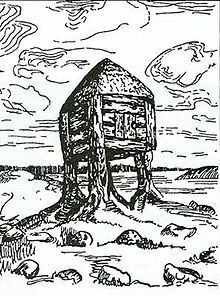 In Slavic tradition, there is a death hut (see sketch below). In the Russian tales, Baba yaga lives in a log cabin that either stands on or moves around on a pair of dancing chicken legs. 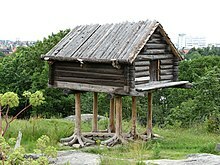 The Sami have a storehouse that looks exactly like it with the “chicken feet” (see photo below).